I have 1198 followers on Twitter. Earlier today, I sent a direct message to each and every one of them. 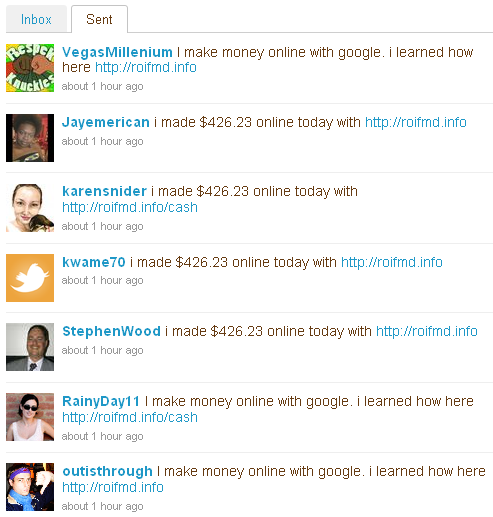 To clarify, I didn't intentionally send a DM to each of my followers, but a DM was sent to each from me claiming I had made $424.23 online today and that I make money with Google. These were spam messages and I have no idea how they were sent by me. I'm Googling the shite out of this, trying to figure out how my account was hacked. If anyone has any idea how these direct messages were sent from my account earlier today, I'd love to read about it in the comments. And if I spammed you earlier today, I'm pleading ignorance. It happens on facebook regularly. I got the message, but didn't believe it for a second. I've seen how you work Google, and I know you couldn't afford that paycut. You didn't DM me, but I got the same message from someone else so it's not just you. Not that I have any more of an idea how it happened, but there you go. I didn't get a DM from you but I'd really like to know how you made $426.23. Do tell! Down Goes Brown is right, I couldn't afford that pay cut. Don't use the twitter website... only use clients and you'll mostly be safe from this sort of hack. I do 99% of my tweeting via Echofon (the old Twitterfox FireFox add-on) and Twitterberry on the Blackberry. Then, there's the Twitterfeed tweets from the RSS feed when I update the blog. I don't use the actual Twitter site. Then do what codexofdreams suggested. Also, if you haven't gone into Twitterfeed in a while, they don't require you to give them your twitter password anymore. They use twitter-connect (or whatever it's called) so I'd recommend changing over to that. I changed my Twitter password and didn't give the new password to Twitterfeed, which is still working. I changed the Twitter password and then got an email from Twitter forcing me to change it b/c they detected my account had been compromised.